Is it small or big? Is it really black? Let’s start from the beginning. 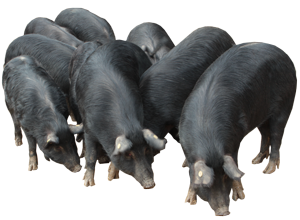 First of all we have to say that the native and antique Sicilian breed of black pig is resistant to disease and adverse climatic conditions. So the Nebrodi territory fits perfectly to its needs. What about the size and the coat? The black pigs are small and have a dark coat, very similar to wild boar both in their features and habits. 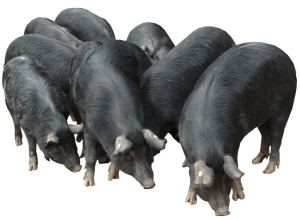 We bred Nebrodi Black Pigs in the wilderness and woods near Messina, in large areas of pasture, and they are fed with acorns and glands. Only when they give birth and during the last month of their lives prior to slaughter, their diet is supplemented with beans and cereals. Its snout is long and the neck is strong because it has to dig deeply. Black pig has strong and thin limbs, in order to permit it to jump, to climb, to run and to walk for long distances. Its spiky hair protect it form sun rays and from bad weather. Such meat, even if presenting a greater quantity of fat than that of the lighter pig, is of a highly superior quality. In particular, the meat contains a rich content of HDL cholesterol, the so-called “good” cholesterol that plays an important role in protecting the human body. In addition, the meat is richer in iron and you can see this from its deep red colour. It has a greater capacity for water retention which results in a better qualitative product in cooking and also in the preparation of the salami. Finally it has an excellent texture when cut. The products of the black pig of Nebrodi have become a symbol of Sicilian goodness. The genuine quality of its flesh makes it a must on the table for those who love quality food.